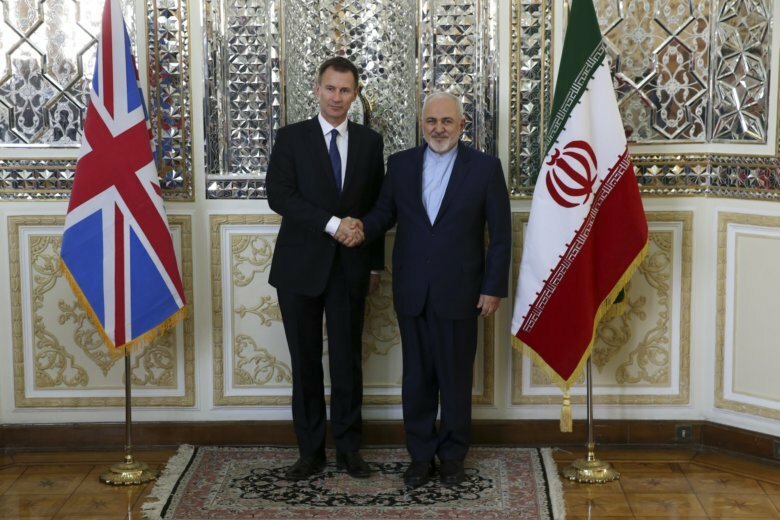 TEHRAN, Iran (AP) — Iranian state media say the country’s foreign minister discussed ways of easing international financial transactions during a meeting with British Foreign Minister Jeremy Hunt in Tehran. Britain’s top diplomat arrived in Iran on Monday, less than two weeks after the United States re-imposed sanctions on the country’s oil and banking sectors. The official IRNA news agency said Hunt and Iranian Foreign Minister Mohammad Javad Zarif also discussed ways of ending the war in Yemen, where Iran supports the Houthi rebels against a Saudi-led coalition. There was no immediate comment from the Britain Foreign Ministry on the talks. President Donald Trump has restored punishing sanctions on Iran since withdrawing the U.S. from the 2015 nuclear accord earlier this year. Iran continues to abide by the agreement, and Britain and other European nations have been trying to salvage the deal. Hunt was also expected to raise the case of British-Iranian charity worker, Nazanin Zaghari-Ratcliffe, who was arrested during a holiday with her toddler daughter in April 2016 and accused by Iran of plotting against the government. Her family denies this, saying she was in Iran to visit family. Her daughter was later released. Since Zaghari-Ratcliffe’s arrest, British officials have routinely sought her release in talks with Iranian leaders. Iranian state TV said Hunt would also meet Ali Shamkhani, secretary of Iran’s Supreme National Security Council, suggesting that talks over the fate of Zaghari-Ratcliffe were likely.